NEXT MEETING - Click here to read next meeting agenda scheduled for 2/13/2019. Board Members Present: Barbara Armentrout, Frank Farm, Joshua Frost, Randolph Hack, Paul Holtrop, Beverly Mau, Darlene Nakayama, Rusti Onishi, Earl Shiraki. Board Members Absent: William Caron, Bradley Rentz, Jaime Rincon. Guests: Captain Jason Katada (Honolulu Fire Department); Sergeant Clifford Ramson (Honolulu Police Department); Dominic Diaz (Board of Water Supply); Director Ross Sasamura (Mayor Kirk Caldwell?? ?s Representative/Department of Facility Maintenance); Department of Commerce and Consumer Affairs (DCCA) Director Catherine P. Awakuni-Col�n; Cliff Kaneshiro (Councilmember Ann Kobayashi's Office); House Representative Calvin Say; State Senator Les Ihara; HK Pae (Palolo Korean Care Home); Bill Chismar, Dave Watase, Cindy Cline, Julia Allen (Residents); Thomas Baldwin (Neighborhood Commission Office). • November 2018 Statistics: There were 1 structure fire, 11 medical emergencies, 2 motor vehicle collisions, 2 mountain rescues, and 2 hazardous materials incident. o Natural Decorations: Dried Christmas trees, wreaths, and other natural decorations are extremely flammable. Remove them from your home as soon as possible. Consider disposing them in your green waste bin or taking them to your nearest refuse center. o Fireworks: Aerial fireworks and novelty items, such as sparklers and fountains, are illegal on Oahu. Firecrackers are legal on Oahu and require a permit to purchase and use. Firecrackers are dangerous and should only be used by a responsible adult. The safest way to enjoy fireworks is to attend a public display conducted by trained professionals. Questions, comments, and concerns followed: Hiking Rescue: Shiraki asked and Captain Katada responded that most of their hiking rescues occur on Kaau Crater. Shiraki asked and Captain Katada responded that they do not charge rescued hikers for the helicopter rescue. Resident Sydney Lynch asked and Captain Katada responded that there has been some discussion regarding charging hikers following a rescue. • October 2018 Statistics: There were 0 motor vehicle theft, 18 burglaries, 13 thefts, 7 unauthorized entries into motor vehicles and 6013 calls for service. • Safety Tip: Holiday Safety Tips: Lock all your doors and windows. Do not display gifts and gift boxes. Write down serial numbers for expensive items such as televisions and electronics. Take photographs of jewelry and other expensive items. If you have a real Christmas tree, never place it near an open flame and keep it watered every day. Do not use open flame candles in your home during the holiday season. When shopping, always lock your car doors and window. Be careful when carrying your purse and/or bags through parking lots. Be careful when using ATMs. When shopping online, stick with big name brand stores and websites when doing online shopping. 1. Aerial Fireworks: Holtrop expressed concerns with illegal aerial fireworks activity in the month of December. Holtrop asked and _ responded that they are doing their best to respond, and encouraged residents to call 911 if they see someone using illegal fireworks. 2. Parade: Shiraki expressed his appreciation for HPD's assistance in directing traffic during parades. 3. Student Drop-off/ Safety: Resident Fannie Cline expressed concerns with two (2) street parking spaces dedicated for student drop off for the pre-school on 10th avenue. She expressed concerns that drivers park in these spots during the morning drop-off and cause double parking problems around the school, which creates a safety hazard. She added that the dedicated student drop off times are not enforced and expressed concerns that HPD will not patrol these areas themselves. Neighborhood Assistant Baldwin recommended that she generate a complaint through the Mayor's office later in the meeting to ensure a written response is processed for this concern. November 2018: Diaz reported two (2) water main breaks, one (1) on Kuahea Street and another on Palolo Avenue. 41st Annual Water Conservation Poster Contest: The BWS is launching its 41st annual water conservation poetry and poster contests. This year?? ?s theme "do your part, be water smart" invites students to creatively express the importance of preserving water now and in the future. The art contest is open to K-6 grade students and the poetry contest is open to 7-12 grade students. The deadline for entries is February 28, 2019. 1. Poster Contest: Chair Hack asked and Diaz responded that winners in the poster contest will have their work featured in the following year's BWS calendar. 2. Red Hill: Shiraki expressed his appreciation to the BWS for their efforts to protect the aquifer as it relates to Red Hill. 3. Wikao Road: Shiraki expressed his concerns with the bump on Wikao Road, which may be due to water issues. Diaz responded that he will follow-up on the concern. 4. BWS Christmas Decorations: Resident Lehua expressed her concerns with the noticeable decline in quality of the BWS City Lights decorations. Resident Lehua asked and Diaz responded that the person who coordinated the lights for many years recently retired. Vacancies: No residents volunteered to fill District 4. Board Member Absences: Armentrout expressed her concerns with the lack of communication from the Board to her regarding altered recess scheduling, which resulted in one (1) of the absences. She expressed her desire to continue serving on the Board. Holtrop asked and Chair Hack commented that Rentz accrued three (3) absences. The Neighborhood Assistant clarified that Rentz does not sit at more absences because the second term does not count absences accrued in the first term. No action was taken to vacate the seats. Proposed Bus Fare Increase: Kaneshiro distributed an article related to Bill 77, the proposed bus fare increase. Shriner's Hospital for Children: Kaneshiro reported that the Honolulu City Council honored Shriner's Hospital for Children in Honolulu for 95 years of service. 1. Proposed Bus Fare Increase: Holtrop asked and Kaneshiro responded that he will find the proposed bus fare increase and report back. Shiraki commented that many in the community are opposed to an increase in the bus fare. 2. Mountain Rescue: Farm asked Kaneshiro if the office might explore a solution relating to helicopter charges for mountain rescues. He commented that an effective solution should not act as a disincentive for hikers to call for rescue. He added that if this solution is not practical, the administration should educate the community considering how frequently these concerns are voiced. Waiomao Road Bump: In response to concerns with the bump on Waiomao Road, DFM reported the following: DFM is working with DDC in addressing the uneven road surface area and natural earth movement on Waiomao Road. DDC is assessing the cause and is preparing plans for City in-house resources to apply asphalt to smooth out the uneven road surface area. Waiomao Road Sinkhole: In response to concerns with the sinkhole at Waiomao Road, the matter is still being explored. Inspections: In response to concerns with inspection policy, the Department of Planning and Permitting reported the following: The DPP is considering alternate hours for inspectors to conduct their site inspections after hours for illegal short-term rentals and bed & breakfasts. Overtime inspection, after normal hours of operation, is also a consideration. 1. Waiomao Road: Shirkai commented that Waiomao needs to be repainted. 2. Striping on Waialae Avenue: Shiraki commented that Striping on Waialae Avenue for bike lane between 10th Avenue and 11th Avenue should be revised to make it clearer to motorists that they may cross over the bike lane before getting to 11th Avenue. 3. Curbing at Waialae Avenue: Shiraki requested installation of curbing and/or delineators to create a more distinctive way to identify the bump out on Ewa bound Waialae Avenue at the intersection with Koko Head Avenue fronting the Goodwill Store. Presently, without such a means of defining the bump out, motorists circumvent the bump out, cross Koko Head Avenue, and cut-into Ewa bound traffic on Waialae Avenue. 4. Striping on Waialae Avenue (continued): Resident Fannie Cline commented that removing the bike lanes in this area would not be an effective solution. She added that they ought to look at the parking spaces by Temura's. 5. Recycling Garbage Pick-up: Resident Cline asked and Director Sasamura responded that currently, all residences and homes that are serviced by automated collection have curb-side recycling. No plans are in place to expand upon current practices due to lane-widths, one-way streets, and other challenges for automated collection. 6. Kuahea: Resident Bill Chismar expressed concerns with the condition of Kuaheia Street and Waiomao Road. He commented that over 12 years, the City has been studying the issues. He commented that due to litigation concerns, the City cannot provide information related to their concerns. Director Sasamura commented that specific issues that relate to the litigation must go through Corporate Counsel (CORP). He added that prior Neighborhood Board reports due provide some details related to construction along Kuaheia. He added that the road's status as a private road add challenges to work on private property, including limitations to working on portions of the road below surface level treatment, as is the case for Kuaheia. A resident commented that the issues that Kuahea Place faces is due to the underground stream on State property. A resident expressed concerns with the issues on Waiomao Road and Kuahea, commenting that they may not be able to drive out of their community due to the degradation. Director Ross reported that the DDC will be alleviating the hump for vehicle travel. A resident asked and Director Ross responded that they are still unsure as to whether a sinkhole is causing the degradation. He clarified that DFM will be making a transition to smooth out the hump. Senator Les Ihara asked and Director Sasamura responded that they are not disturbing the sub-surface because it is unclear what consequences will follow future disturbances. 7. Sewer System: Resident Maile Beach-Smith requested information on plans to upgrade sewer capacity serving Lamaka Place as it related to Accessory Dwelling Unit approval. 8. Monster House Bill: Resident Cline requested an update on the Monster House Bill, expressing concerns with recent monster home developments in Palolo. Governor David Ige's Representative - Department of Commerce and Consumer Affairs (DCCA) Director Catherine P. Awakuni-Col�n gave highlights from the December 2018 Capitol Connections: Capitol Connection Summary: Awakuni-Col�n reported from the Capitol Connection newsletter for December 2018 includes stories related to a multi-resource management plan to protect Central Oahu's vital water resources and to improve habitats for native species and a story related to the Office of Enterprise Technology Services working with State Departments on projects to make government more efficient. • Sewer Replacement: Representative Say reported that a sewer replacement project will begin in January 2019. • 7th Avenue and Keanu: Representative Say reported that DTS will be exploring a four (4) way intersection at 7th Avenue and Keanu. • Replacement of Telephone Poles: Representative Say reported that the replacement of old telephone poles will be under the jurisdiction of Hawaiian Electric. • Waiomao Road: Representative Say expressed appreciation to the City administration for providing updates on Waiomao Road. Questions, comments, and concerns followed: Lack of Responsiveness: Resident Ashley Noji expressed her concerns with the lack of responsiveness from local officials regarding the future of Kuahea Place. • Legislative Session: Senator Ihara reported that session begins on January 16, 2019. • Ala Wai Canal Project: Senator Ihara reported that the Legislature appropriated planning funds for the Ala Wai Canal Project to help complete the first phase of the project. Senator Ihara commented that he is holding discussions to help address some of the concerns that have been raised for the project. He commented that Congress fully funded the design and construction phase of the project. He added that whomever has jurisdiction over the project, City or State, will be responsible for signing the environmental impact statement. ??? Environmental Impact/ Community Impact: Watase reported that the Army Corps of Engineers will need to dredge 1000 feet of natural stream for the retention basins. He added the basins are designed to hold back thousands of gallons of water, commenting that it is unknown what the impact on the surrounding community will be. He expressed his concerns that the community will see further issues similar to the degradation of Waiomao Road. • Resolution: Watase requested that the Board consider a resolution opposing the project to protect the residents and property owners surrounding the proposed retention basins. • Impacts: Watase commented that two (2) retention basins have been proposed in Palolo, all involving different private properties. He outlined the impact the construction will have on the residents of the Ala Wai Basin as a whole. He commented that many property owners will lose their homes for the construction of the project. He added that property owners impacted by the construction and downstream were never notified nor made stakeholders of the project. He added that the draft EIS only included three private properties, but was expanded to 13 properties after the comment period, and without public oversight. He commented, in order for the Army Corps of Engineers to fulfill the Environmental Policy Act, they must engage all those affected by the project. • Model: Watase commented that the modeling process has been brought into question. He commented that the 100 year flood impact has been used to justify the retention basin. He clarified that the Army Corps of Engineers admits that the model was unrealistic, but it is still being utilized. He added that even after their post-construction modeling, many areas outside of Waikiki will still be at risk of serious flooding. He expressed concerns with the funding, commented that funding is also based on the projections from the model. He commented that, without public oversight, the necessary funding was significantly expanded over several years. 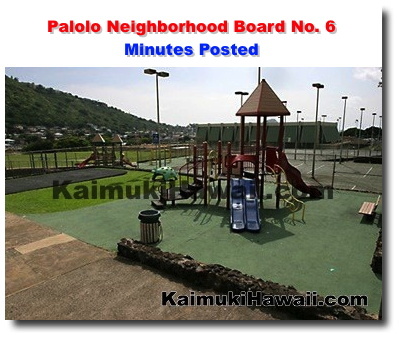 He expressed concerns with the accuracy of the modeling process, commenting that five (5) year floods will bring significant property damage to Palolo. He added that given Palolo's history, this does not seem to be the case. • Maintenance: Watase expressed concerns that when the project is finished, the residents will have to pay more in taxes to maintain the retention basins. • Meeting Facility: Pae reported that the proposed meeting facility will be in the existing memorial hall. • Elderly Day Care Program: Pae reported that the proposed elderly day care program will be in the existing meditation hall on the second floor of the cultural center. • Additional Details: Pae reported that no alterations of the existing space, with operating hours of Monday through Friday from 8:00 a.m. to 5:00 p.m. The initial number of elderly residents will be around 15 members. The program will start with the temple members, but will be later opened to the public. The program will be limited to the facilities of the second floor of the cultural center with members to be supervised by staff. ??? Conditional Use Permit: Pae commented that the conditional use permit will also resolve previous outstanding violations. 1. Parking: Holtrop expressed concerns with increased activity and the impact on available parking. Holtrop asked and Pae responded that the parking count will likely remain status quo, adding that the same members that already visit the cultural center will likely be utilizing the program. Holtrop asked and Pae responded that the Meeting Facility is intended to address outstanding violations, but the use of the hall will remain unchanged. 2. Day Care Program: Shiraki asked and Pae responded that this is not intended to be a care home, clarifying that this will use existing spaces. 3. Permitting Process: Shiraki asked and Pae responded that the intention with the conditional use permit is intended to resolve a long standing concern with outstanding violations. He clarified that after the violations involving the construction of the memorial hall were observed and corrected to code in 2003, the City and County of Honolulu inspectors never returned for approval. He concluded that the Conditional Use Permit is intended to solve this problem. Community Recognition Committee Nomination: No report was given. Special Committee on Monster Houses: Chair Hack reported that a committee meeting is planned for January 9, 2019. Farm moved and Mau seconded to approve the Wednesday, October 10, 2018 and Wednesday, November 14, 2018 Meeting Minutes as AMENDED. The motion WAS ADOPTED by UNANIMOUS CONSENT; 9-0-0 (AYE: Armentrout, Farm, Frost, Hack, Holtrop, Mau, Nakayama, Onishi, Shiraki. NAY: None. ABSTAIN: None.) Amendments: Strike all instances of "Waimao" and insert "Waiomao"
C. Bulky Trash Pick-Up - Take out no-earlier-than one (1) day before the third Wednesday of every month) to preserve the beauty of the valley. Report via Honolulu 311 Smart Phone Application or https://appsto.re/us/SiStC.i Call 768-3203 for violations. G. Designated Board Members to Assist to Close-Up - Thank you to Shiraki for arranging. ADJOURNMENT: The meeting adjourned at 8:35 p.m.